We flew into Miami the night before the cruise and used our points to stay at the Miami Airport Marriott. Since we were at the Elite status of Marriott points, we had access to all the soft drinks and bottled water we wanted. We packed a few of these beverages into our suitcases to avoid paying for bottled water and soda on the ship. The cruise left from Fort Lauderdale again this year. Capital Jazz again provided complimentary shuttles to the cruise terminal from both the Fort Lauderdale airport and the Miami airport on the day of the embarkation. Traci and I had the Marriott's complimentary shuttle drop us off at baggage claim at the Miami airport where we joined other Capital Jazz passengers who were waiting for the cruise shuttle. By 10:30 AM, we were on our way to the cruise terminal. Traci spent a portion of this 45-minute ride on the phone with the Marriott after she realized she had left one of her two cell phones at the hotel. By the time we arrived at the port, she had made arrangements for the hotel to mail her phone to our home and to have our next door neighbor be on the lookout for the package. Traci was disappointed that she left her phone at the hotel but relieved that it was recovered. She still had her other phone with her but in a few hours, pretty much everyone loses phone service while the ship is out to sea. As expected, the cruise terminal was very crowded when we arrived. There were five cruise ships in port that day. Traci and I decided to carry our own luggage onto the ship instead of leaving it with the porters to deliver it later in the evening. We entered the terminal for the Carnival Freedom and spent the next half-hour or so inching through security and check-in lines. At the time of our cruise, the Ebola outbreak in West Africa was in the headlines daily. 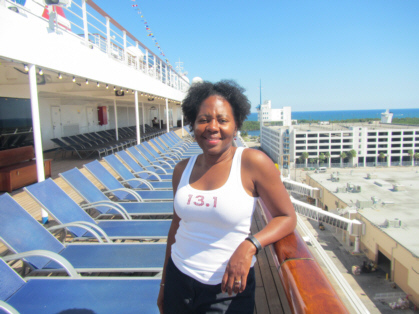 One person in the U.S. had recently died from the virus and it was discovered that one of the nurses who treated the victim had gone on a cruise afterwards on the Carnival Magic thus raising the concern of the virus infecting others. It came as no surprise that the health questionnaire that all passengers must fill out before boarding a cruise ship included question pertaining to Ebola and if you have traveled to West Africa recently. We were onboard by 1 PM. There was a general announcement indicating that cabins would not be available until 1:30 PM. Traci and I decided to find our cabin (8356). In the process, we discovered that it was already available. Like the previous year, we had a veranda (balcony) cabin. It was on the 8th deck instead of the 7th and it actually seemed more spacious this year. The only drawback was that the Pool Deck was above us. From time to time, we could hear the footsteps of people above us. Very early in the morning, we could hear what I assumed to be tables and chairs being dragged as the crew prepared the Pool Deck for loungers. 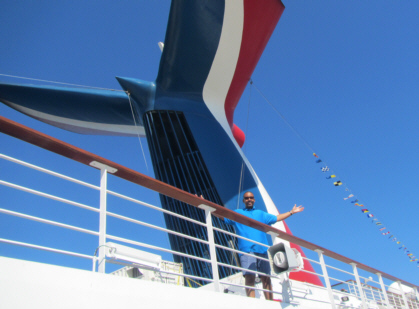 Since Capital Jazz used the Carnival Freedom the previous year, Traci and I already knew our way around the ship. We headed upstairs to the Lido Deck for lunch. Based on my experiences from last year, it was not the buffet I craved but the food stations – namely the Indian Tandoor station. To my dismay, the Indian Tandoor station no longer existed. Instead, I tried Guy Fieri’s Burger Joint for a cheeseburger and fries. It was good and quite filling. Traci went to the Mongolian Wok cook-to-order station but she was disappointed with her dish this time. It did not take long for us to get settled into a routine. In fact, we were out and about so often that it was two days before we finally met our cabin attendant. He did a great job of cleaning our cabin and making towel creatures each day. 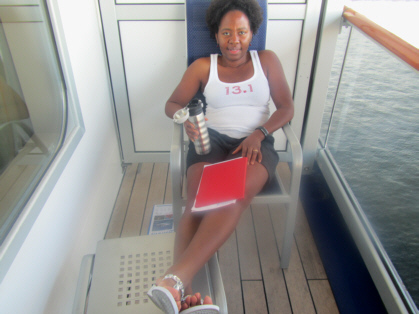 It was quite some time after the mandatory lifeboat drill that our cruise finally got underway. Traci and I always ate dinner in the Posh Dining Room around 6 PM which is considered early seating. Late seating was at 8:15 PM. We would spend the rest of the evening going to concerts. There were two evening concert venues on the ship. On most evenings an artist would perform two shows in the 425-seat International Lounge - one at 8 PM and one at 10:15 PM. 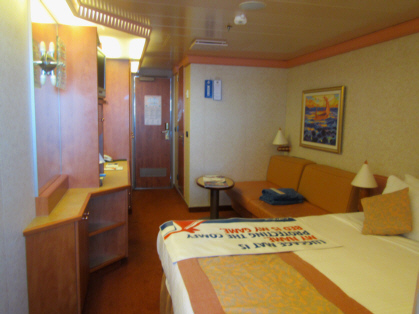 The International Lounge performances were normally simulcasted on a TV channel in the ship cabins. There were also two main stage concerts in the 1,400-seat Victoriana lounge - one at 6 PM and again at 9:15 PM. For those who could stay up late enough, the International Lounge would host the Get Down Club concerts at midnight that had more of a new age/underground flavor. I heard some fantastic music at the Get Down Club. The midnight jam session in which musicians would collaborate on tunes would take place in the Victoriana. These were fun as well because you never knew who was going to get on stage and improvise. It was a great opportunity to hear artists really 'stretch out' and show just how talented they really are. For our first night of evening concerts, Traci and I attended the 8 PM show of soul singer Anthony David. For his final song, he was joined on stage by Algebra Blessett to sing their hit song "4Evermore". This was a pleasant surprise. I did not remember seeing Algebra's name in the lineup for this year's cruise. The duet sounded great. Following Anthony David's show, we went to the Victoriana for the 9:15 main stage show. 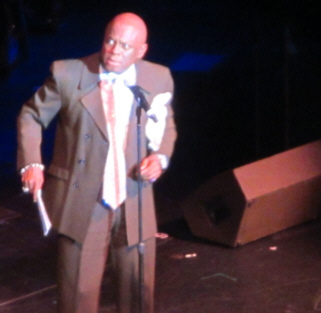 The first performer was comedian/actor Michael Colyar. He did a funny clean set of comedy. He would do a "Down & Dirty" comedy set later in the week for those who prefer their comedy raw and edgy. Michael Colyar's set was followed by our favorite performance of the week - Naturally 7. This group was mind-blowing! In addition to being an a cappella group, they go a giant step forward as vocal instrumentalists. They imitate instruments with their voices so well that we were in disbelief that there was not a band off-stage somewhere accompanying them. They got several standing ovations during their show. This was the first time I have ever witnessed a group get a standing ovation on music from an upcoming release. 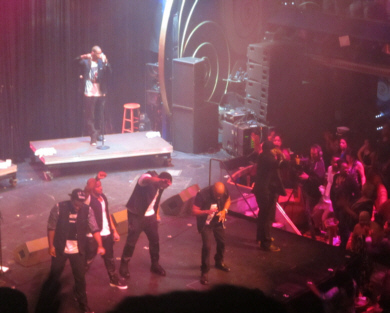 Naturally 7 was definitely a highlight of the Capital Jazz cruise. We will be sure to check them out if they ever do a show near us. Naturally 7 - incredible performance!!! The main stage show ended around 11:15 PM. This is around the time people start to head up to the Lido Buffet for some late-night eating. On most nights, I would have a slice or two of pizza while I tried to stay up for a midnight concert. These shows normally started later than midnight to give the technicians time to reset the stage for a different set of performers. Knowing this, I took advantage of no line in the laundrette at midnight to use the iron. Afterwards, I had a decision to make. R&B singer, Eric Roberson was doing his Erro show in the Victoriana. At the same time, the Urban Jazz Coalition was doing a Get Down Club show in the International Lounge. I decided to check out the Urban Jazz Coalition. They played some nice smooth jazz.